“Thus have I heard,” the formulaic opening to many sutras, reminds us that for some period after his death Shakyamuni Buddha’s words were transmitted in an oral tradition, as heard, literally hearsay. As the Dharma passed down the generations—mind to mind, language to language, culture to culture—the formula remained, a caution not to mistake hearsay for gospel but as no more nor less than the last word in a long lineage of words. Present-day students of the Dharma who are not literate in Sanskrit, Pali, Chinese, Tibetan or Japanese receive the teachings via translations. Aware that the exposition of the Dharma inevitably alters in passage, we had best consider what it has altered from. Reading with a less naive, more educated eye, we stand a better chance of seeing how we might be being led or misled. Such a discerning reading would qualify as a mindfulness practice in itself, no less than mindfulness of breathing, posture or the rising and falling of thoughts, not assuming anything, looking into the matter before us in all its complexity. Seeking clues to this practice of reading the Dharma, I conferred with two translators, Steven Goodman and Gil Fronsdal. Goodman, a professor of Asian studies who works with Buddhist texts in the Indo-Tibetan traditions (Mahayana and Vajrayana), spoke of the rigors of searching for, and the pleasures of finding, apt equivalences between Tibetan and English. He told how for days he mulled over the translation of a Tibetan term signifying, literally, “heart bone” (nying ru). Usually the term was translated as “fortitude” or “endurance.” Goodman remembered Ezra Pound’s challenge to translators: get the meaning (logopoeia), the imagery (phanopoeia) and the music (melopoeia). Goodman didn’t want to lose the key images—heart and bone. His Tibetan teacher told him that really good practitioners develop a small bone in their heart, which only becomes evident when found amongst the ashes at cremation time. This explanation helped Goodman come up with a happy equivalent: “stout-hearted.” Quaint as the phrase might be to the modern ear, in its hearty physicality it evoked the original. Hidden in the language and literature of the West, hearkening back to the days of King Arthur, it seemed an idiom worth reviving in its own right. As he described it, finding the match was not so much an academic enterprise as a linguistic pleasure, a cruise from one culture to another, crossing the waters of obscurity to clarity. Granted, the right word in the right place was critical, as a well-lashed raft is critical. But as Buddhist teaching instructs us over and over again, the raft is meant to be left at the shore once the crossing is made. The traveler can then move forward unencumbered, stouthearted. Gil Fronsdal, a teacher in both the Zen and Theravadin traditions and a translator of the Dhammapada, spoke of the delicate balance between translating the Buddha’s words as accurately as possible while keeping the text readable and enjoyable. According to Fronsdal, the first qualification of the translator is literacy in the original language of the text, and he criticized “adaptations” based on other translations. Next in importance, translators should be prepared to clarify the personal, professional and cultural lenses through which they as translators are inevitably viewing the text at hand. Informed by that awareness, translators are better equipped to put aside their biases, or at least make them known—helping readers to avoid taking the text at face value. Fronsdal also emphasized how the articulation of the Dharma has changed in its passage outward from India, how it is changing in our time as it translates into the languages of the West. He saw this change as inevitable and not necessarily a bad thing—Buddhism adapting to the time and place—but warned that we need to be clear as to what it is changing from. As an example, he pointed to the variety of ways Mahayana Buddhism’s fifth precept, “No selling of alcohol,” has been worded in present-day sanghas. He enumerated some of its more common forms: not selling the wine of delusion, not being intoxicated, not giving or taking drugs, not being ignorant, not intoxicating self or others, not clouding the mind. Some of these interpretations expand the precept to include mental states that may have nothing literally to do with alcohol. Some focus on prohibiting intoxication, an issue seen as more important than selling alcohol. Although he finds no fault in such praiseworthy cautions, he wants to have made explicit what ethical principles are behind changing the precept from what it is in Asia. CHINA, from the Teabowl “field traces” suite. Polymer intaglio print. 4.5″ x 9″. © Davis Te Selle. with the moon and stars. 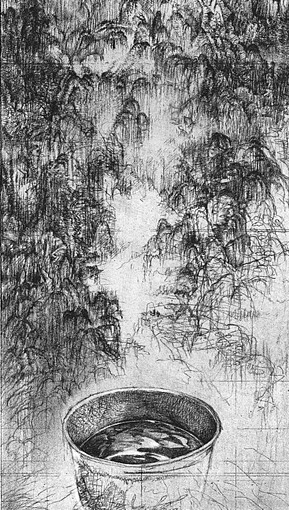 Waddell’s rendering, elegant and simple, transports me to the banks of Baisao’s iris pond before the Hall of the Thousand Buddhas. Looking into the old tea seller’s cup, I see the sun and stars and moon that, shining in his hemisphere, shine also in my own. At the same time, I am aware that the poem as he originally calligraphed it, as well as the printed versions subsequently published in the Baisao Gego, would have appeared totally different from the version on the page now before me. Baisao’s poem was written not just in a different language but in a writing system wholly alien to that of the West. His heavens were drawn from Chinese pictographs, each a gestalt, rather than as words and sentences strung together in lines of letters bearing no resemblance to the material world. Without question, I have a vivid imaginative experience, admirably facilitated by Waddell’s words, of a summer night brought to Earth, but that night is my own more than Baisao’s, more closely resembling summer nights in my heartland of Iowa—fireflies rising over corn fields—than those of urban Kyoto. Baisao’s experience and the poem that expresses it are forever Baisao’s, and Waddell’s transmission of the poem is, properly speaking, Waddell’s poem. In turn, my reading of Waddell’s poem is my reading. As well, I need to keep in mind that Baisao and I occupy very different positions relative to the iris pond before the Hall of a Thousand Buddhas. Some years ago I stood in the entrance of that very hall, Sanjusangendo, taking in the gleam of rows and rows of golden-faced figures, thinking, These are not my Buddhas. They were Japanese Buddhas, icons carried in the bones of the Japanese people through generations of presence in their native temples, fields, homes and streets. With my Roman Catholic upbringing, I carry in my bones different icons: Jesus, Son of God; Mary, Mother of God. For all the Buddhas in the temple hall, I was on the outside, one more tourist taking photographs. Better to admit and accept my foreign status (in Japanese, gai-jin, literally “outside person”); better to leave Baisao’s cup and what’s in it to Baisao. Then I’m free to take possession of my own proper cup, with all that my native language and culture pours into it, including William Blake’s “world in a grain of sand.” It is an act of respect, both for one’s own culture and language and that of the other’s, to keep them squarely in their own territories. Then we can appreciate who we are relative to each other: foreigners all. More than appreciate, we can try on, as much as the written word will allow, the perspective of another sensibility and another culture. It’s not so difficult, perhaps, to be aware of our foreignness when it is a geographical fact but harder to keep in mind our fundamental foreignness, no matter what the language. Every speaker and every listener, every writer and every reader crosses oceans—of some combination of gender, ethnicity, family, education, social status and general life experience—to reach another. Each stands precisely on coordinates of the planet no one else could possibly occupy. In the case of the Dharma, only from that place, seen into thoroughly by one’s own lights, can one transmit instruction conducive to liberation. It’s the ground on which Buddha and Baisao stood, the ground on which Steven Goodman and Gil Fronsdal stand, conscious of their own perspectives, balancing accuracy with readability. It’s the ground on which the mindful reader stands, aware of his or her particular position, with all its advantages and disadvantages, in relation to the text in hand. The more sincerely we make and take account of our own proper sphere, the greater the chance we can help each other walk the Way, each in our own way. Seeking the original meaning of the Buddha’s teaching through the translations I have available to me, in the end I can only repeat what others have said before me: “Thus have I heard.” What, however, about my own living of the Way, and my own expression of it? For the teachings are personal invitations to step into one’s own life, freeing oneself and others from suffering and confusion. Baisao did so traipsing the byways of Kyoto, brewing his tea, and offering it to all who came. It’s time I brewed my own. I make a pot of Irish breakfast and take it out to my backyard patio. The sunlight of this just-past-solstice California noon filters through the broad leaves of the persimmon tree, and the shadows of butterflies flit over the surface of the table. An airplane drones overhead. The garden cat lolls at my feet, licking her paws. About to pour myself a cup, I pause, startled to see it empty, entirely empty, only sunlight filling it, glinting at the lip, shading into the bottom. I go ahead and pour out the dark beverage, which, miraculously, the cup contains: next to nothing, yet nothing lacking. As I raise it to my lips, it occurs to me that the moon and stars Baisao found in his cup may have been no more, and no less, than just this. It’s enough. If anything remains, it’s to express this bit of sun, this backyard dharma, in words native to me—and pass them on.